Yes, we are officially in the 6th month of the year, and while I’m no mathsman, my research leads me to believe that this means we are half way through 2018 already. My kids are huge fans of this particular month. Why? Because school is out. But there’s at least one school that stays in-session year round: cPanel University. That’s right, no holidays for our students. Our students don’t even want a summer vacation; that’s how dedicated they are. It makes pitching the idea of having a 3 months’ paid summer vacation to my boss very difficult, so I’d really appreciate it if you could all be a little lazier about the whole thing. All user accounts have been updated to use the email address as the username. If you have trouble logging in, make sure you’re using your email in the username field, along with your usual password. If you still have trouble after that, let me know! I’ll get you fixed up. cPanel Conference 2018 is the big one, and not much has changed on this front just yet. It’s still in Houston, still on October 3rd, and we’ll still be there to award Version Certification 2018 to those fortunate and prepared enough to take on this challenge. 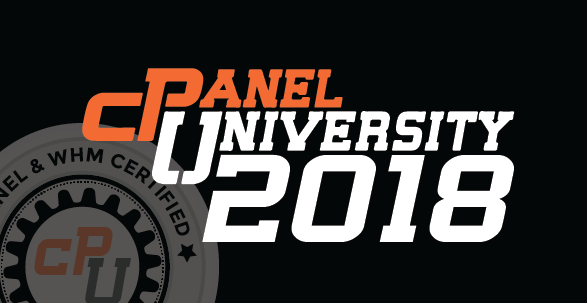 This certification is the only one we provide live and in-person in the cPanel University Center, at the conference. We want to make it a fun and rewarding experience for all involved, so watch out for announcements on what you can get by dropping by to take this exam, as we move closer to the big day. For conference updates, keep an eye on the site at conference.cpanel.com for new event information to be posted as it becomes available, or even get in your early-bird registration now. Wondering why? GPDR is the answer to that question. Wondering how it impacts cPanel? Wonder no more. Our resident expert, David Snead, goes over everything you might want to know about GPDR and its effects on cPanel as a product and a company, as well as how it affects its users. It’s here. Two long-awaited releases are making their first public appearance on the University. I requested the budget to have a team of Hollywood CG and editing professionals create an action-packed launch trailer with soundtrack by the 90’s hit band, Enigma, but was cruelly denied. So instead, you’ll have to put up with this newsletter (you don’t actually have to put up with it, and the denial was actually very reasonable). If you look at the main site right now, university.cpanel.net, you might notice that things look a little different. Well, you’re not crazy (probably) – the re-design of the site has been officially launched and is now online for all to see. Feel free to explore around and check out what’s new. Log into your account using the same email address and password you already use on cPU, or use your existing cPanelID authentication. It may not seem like much at first, but this re-design is setting the stage for big possibilities moving forward. We’ve done our best to try and make this switch seamless, but this bun’s fresh out of the oven, so if you do run into any snags, certainly give us a heads up so we can take care of it! The first iteration of the long-awaited cPanel Professional course and certification have gone through internal and beta testing, and are now available for public access. This course is unique in a couple of ways. First, the certification is provided simply for the completion of all units within the course. This means that there is currently no exam required. However, the units are all video-based, and are interspersed with questions to test your memory; the goal being to familiarize yourself with various areas of the cPanel account interface. The amount of interface items available is substantial, so the coverage in this course is strategically selective. However, we’ve tried targeting the items that many users have requested, and that we think will be most useful to our users. We will also be building on the existing content throughout the year to expand into additional areas of the interface. Thank you to all of those who volunteered to help out with the beta/early access program. At this time we have a sufficient number of users and are considering it closed to new membership. However, feel free to contact us if you would still be interested in participating in the future, should the program become open again. As always, we want to hear from our users so that we can do our best to give them what they want to see. You can have a direct impact on the kind of content that we create, and the material we focus on. If you’d like to see courses or material on a specific topic or have concerns about any of the material that’s already available (we do our best to keep it updated, be we know that there is some rough-around-the-edges material out there), let us know by emailing us at professor@cpanel.net! Even if you just have a question, or need some guidance on one of the topics – we can help. By the way, did you know that cPanel’s on Discord and Slack now? Feel free to throw us a message here, or catch us online in chat. This entry was tagged conference, cppro, june, newsletter. Bookmark the permalink.